If you don't already have one, it's time to get a great fitting white blazer, because this is a wardrobe staple which will surely wear its' worth. I don my white Wallis blazer to tons of work events and also love to pair it with jeans for weekends (how I've styled it). Personal style bloggers turn up the heat when it comes to rocking a white blazer. Julie from Sincerely Jules juxtaposes her white blazer with laid back tennis shoes and a tee shirt for a downtown look whereas Blaire from Atlantic-Pacific adds structure to a bright floral print dress with her optic white jacket. My favorite way to style the trend at the moment has to be with boyfriend jeans like Alicia from Cheetah is the New Black did. Models and fashion editors freshen up a traditional black blazer and go for white when they want to keep their look effortlessly chic. By the way, it is a great time to shop because now through April 28 Saks Fifth Avenue is having a 25% off 'Friends and Family' Sale when you use code FRNFAM2 at checkout online. Since I have my staple white blazer I'm eyeing this Cotton Eyelet Jacket. Happy Shopping! 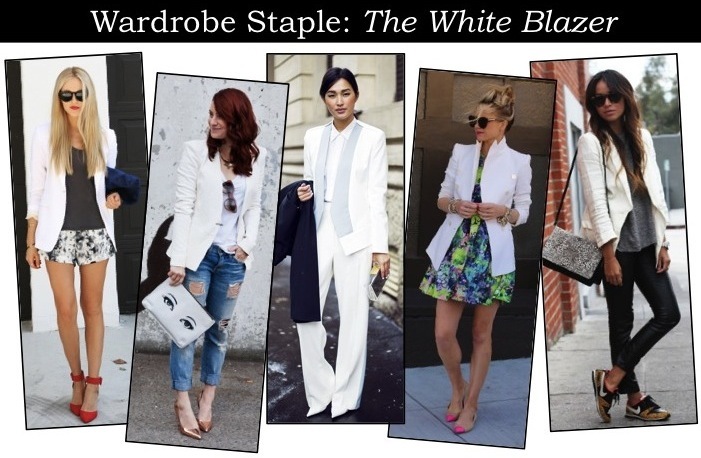 I love how versatile a white blazer is–which is why I can't believe I still don't own one! I definitely need to get my hands on one before summer kicks off! I can't find a nice, cheap white one. So sad! I love it! I have a white pique one that I have to remember to start using. My friend got a Chloe one that is killing me. She looks so HOT in it. Too bad its out of my budget. SO I love your finds here! Love it! I bought a white blazer but I've never worn it because the button needs to be sewn on. I got it at a great discount because of it...but sheesh I really need to get around to that! I need a white blazer. Totally agree! I saw that outfit from Peace Love Shea the other month and went right out hunting for a white blazer. I got one from Zara that I love for under $100, and love it! I love my white blazer but I still want to find another one and it's not that easy. Love your picks! Love it. 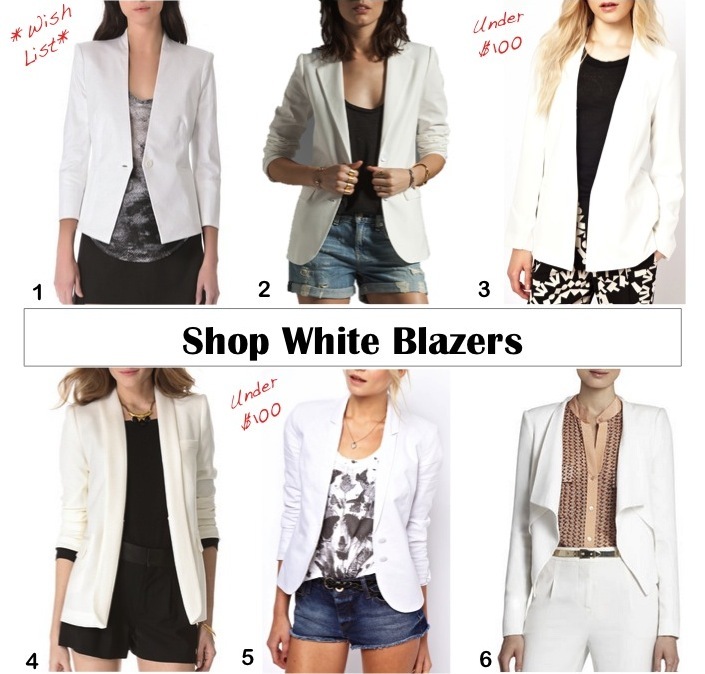 I totally agree that the white blazer is a must have! I still can't believe I don't have a white blazer! I have neon yellow one, and a sequin one, but no white. sad.